"Dreaming of a time when the snow might stop falling..."
Upstate New Yorkers would probably tell you that they'd love for a winter without snow. Maybe even two winters. But ten consecutive winters? That might be asking a lot of an area of the country that prides themselves on a toughness that comes from surviving brutal cold on an annual basis. 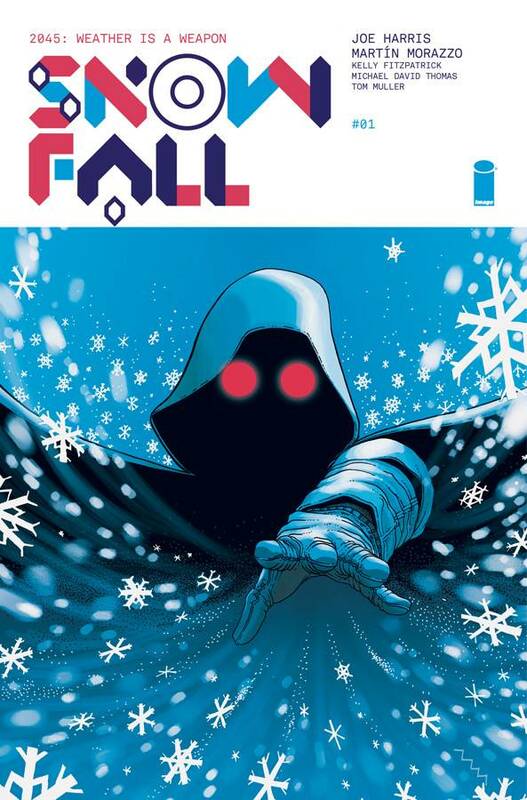 With global warming though, snow could be on the way out and it's something Image Comics explores in Snowfall #1. The issue is written by Joe Harris, illustrated by Martín Morazzo, colored by Kelly Fitzpatrick and lettered by Michael David Thomas. Climate change is a real threat and Harris seems content to remind readers of that in Snowfall #1. Anthony Farrow is the conduit for doing so, serving as a surrogate for those with the idealogical views that denying climate change will do more harm than good. 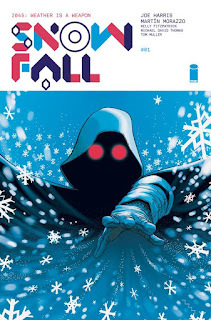 Snowfall #1 takes place in a world where snow no longer falls (until it does) and Harris is keen to infuse the book with Farrow's conspiracy theorist skepticism as to whether the corporations are really there to protect the interests of citizens. In that regard, Snowfall #1 a broader look at the corrupting force of money in politics as opposed to just denying climate change. It's a lot to cram into one issue, however, and despite Harris's best efforts some of the world still feels a little confusing by the end of the issue. Morazzo gives the book plenty of great panels that highlight the world's new normal, including pretty vast backgrounds populated by characters with strange facial expressions. In fact, many of the panels tend to focus on the faces of the characters as they make certain mental realizations and Morazzo is more than capable of keeping up via effective emoting. The arrival of snow in New Mercy is definitely a big deal and thanks to Morazzo its importance is emphasized through a contrast with other locales that don't have any snow. One of the most striking aspects of the book happens to be Fitzpatrick's coloring, which emphasizes a wide variety of pastels mixed in with darker, primary colors. It's a great juxtaposition between scenes because of the colors chosen that reinforces the magnitude of an event like snow falling in a settlement. Snowfall #1 is a fascinating first issue that takes the concept of global warming to the next level. It's got a very clear science-fiction angle to it that will likely get more mysterious as the series proceeds. Harris is making a very strong statement in regards to climate change with Snowfall #1, but it's not overtly preachy. Morazzo's illustrations are a great fit for the narrative and effectively reveals the state of the world to the reader. Snowfall #1 is interesting and definitely has the potential to explore some pretty solid leads. Snowfall #1 is in stores now.